Thanksgiving is just around the corner, so I decided to make a Shortcut Pho Ga, Vietnamese Chicken Soup. And now, I’m sure you’re wondering “What on this side of heaven does Pho Ga have to do with the Great American Turkey Day?” Ahem. Thanksgiving, that is. Because Pho Ga, like so many soups made with Chicken, can just as easily be made with Turkey. Leftover Turkey. See how I just keep capitalizing Turkey! Turkey I love thee – but I love thine leftovers more. If you use Turkey, I guess technically this soup is Pho Ga Tay. I usually do the whole works with the Turkey for Thanksgiving. I make it, eat it and then do the Turkey stock/broth thing. But this year, I’m pretty sure (if I follow through – I seem to have Thanksgiving ADD, I’ll make this, no that, well maybe this…) I’m making a rolled/stuffed Turkey roast of some sort or maybe a Ham. So there goes the whole stock thing. And I know a lot of people don’t make stock from the carcass so a shortcut Pho Ga is in order. 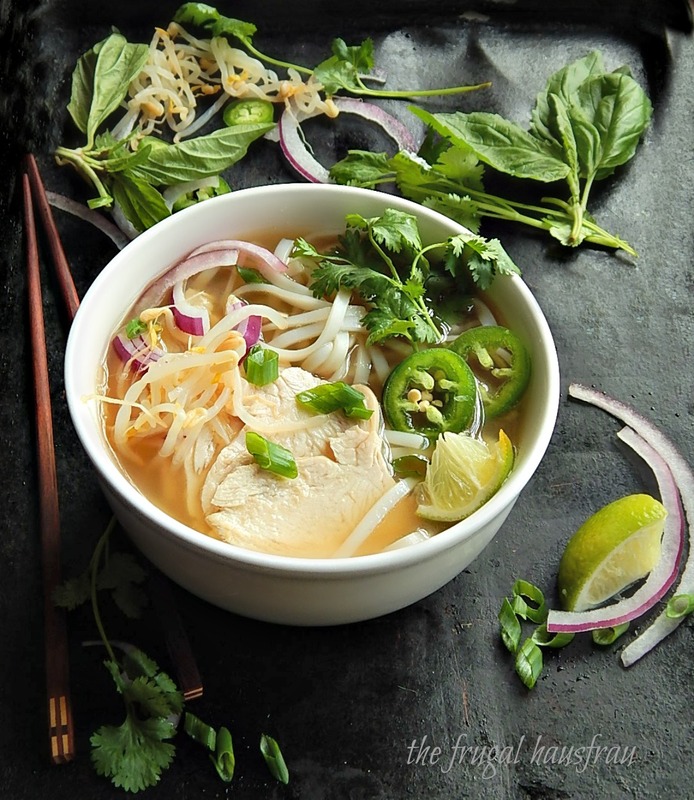 I do have a great Pho Ga on this site already, but this is going to be a down and dirty, quick and easy version, for the stove-top or Instant Pot. I’ve been giving my Instant Pot lots of love, lately, you might have noticed. But I’ve already said “love” way too many times in this post! We’re going to take some stock/broth, store-bought or home-made and doctor it up with exotic spices and herbs from far-flung lands. The heady aroma is going to waft through your kitchen as you sit down to the table with your herbage and taste as you drop each into the steaming broth and the heat releases those essential oils. And for a moment, you’ll forget you’re in the bleak of winter and be transported to another world. A world that’s not windy and cold. A world that’s busy, noisy, happening and maybe just a little hot & humid. But you don’t care. Because you have Pho! As you sup and sssslurp through the Pho (and yes, it’s acceptable to slurp) you’re going to be amazed. Amazed at how good it is, but even more amazed by how easy, and if you’re like me, a little amazed that you even made it! Bring a large pot of water to a boil and turn off. Immediately add the noodles, pressing down to submerge. Soak for 30 minutes until softened. If not softened to desired consistency when broth is ready, turn the heat on and warm the water until cooked through. Heat Instant Pot on Saute function with 1 tablespoon oil. Add onion, cut side down and ginger slices and cook without moving until slightly charred on bottom. Ginger will need to be turned. When onion is ready, toss in the coriander and continue to cook for one minute. Immediately add broth, then star anise, cloves, sugar, and cilantro stems. Add lid to Instant Pot and set on High Pressure for 10 minutes. When the 10 minutes is up, release pressure manually (quick release) add strain the broth, discarding solids. Add fish sauce, then salt to taste. Broth should be highly seasoned. Add garnishes as desired. It’s helpful to add to a platter from which everyone can serve themselves. Note: if no cooked chicken or turkey is available, add a large chicken breast to the Instant Pot but increase cooking time to 15 minutes. Remove immediately and set aside to rest, then slice or shred. Heat Dutch oven or large pot over medium-high heat with 1 tablespoon oil. Add onion, cut side down and ginger slices and cook without moving until slightly charred on bottom. Ginger will need to be turned. When onion is ready, toss in the coriander and continue to cook for one minute. Immediately add broth, then star anise, cloves, sugar, and cilantro stems. Bring to a boil, cover with lid ajar and simmer for 30 minutes. Strain, then add fish sauce, then salt to taste. Broth should be highly seasoned. Notes: If no cooked chicken or turkey is available, add a large chicken breast to the broth; cook until easily pierced with a knife, about 10 to 12 minutes. Remove and set aside to rest for a few minutes then slice or shred. I’ll be bringing this to Fiesta Friday #198, hosted this week by two women of great taste; both well seasoned bloggers: Judi @ cookingwithauntjuju.com and Liz @ Spades, Spatulas and Spoons.This is going to be a fun party with all kinds of Holiday foods! If you came to this recipe looking for a way to use leftover turkey or chicken, be sure to check out the link below for 12 Days of Turkey. You might want to see the sister post for 12 Days of Ham, too. This entry was posted in Click here for Bargain Meals, Click here for Fabulous Food Posts and tagged Apple, Asian, Bean Sprouts, Chicken, Chicken Stock, Hot Peppers, Instant Pot, Jalapeno, leftover Chicken, leftover turkey, Lime, Pasta, Pho Ga, pho ga tay, Red onion, Soup, Turkey. Bookmark the permalink. If you keep posting these great recipes using your insta pot I’m going to have to go buy one. Remember I am the old-fashioned pressure cooker gal. Looks good – never had this kind of chicken soup. It may be time to break from my traditional chicken noodles soup and give something new a try. Happy Fiesta Friday! I have a stove-top pressure cooker, too – So when I was travelling back and forth from the folks, I used my stove-top up here in the cities and I think I really love the set it and forget it ease of the “IP” – the one draw back of the electric is you can’t run water over it for that quick release, although you can place a cold damp towel on the lid, and there is a quick release valve but it’s not almost immediate like it is with the cold water. Just thought I would let you know I just received an email from TASTE saying “You are going to buy an Insta Pot on Friday” and then I open it and they are offering a cookbook. Too funny – are you reaching out to me over the internet LOL Kind of spooky! Beautiful Mollie! Esp love that last picture, the lighting, the plating and the colors. Love Vietnamese soups, they are a burst of flavors in your mouth. Great job! Happy Thanksgiving to you! It’s been so crazy here, Rhonda! Now I may be back in SD!?! And my son is coming in from up north tomorrow so we may even have a pre-thanksgiving thanksgiving, lol! Sounds good– you can’t have too much Thanksgiving Mollie! Up north?? In Minnesota– you can’t get more north than that!! I know the folks will be glad to see you too. Waiting to hear how it all plays out! hugs from here! Very tasty looking bowl of soup. I wish I could travel to more places! Budapest has always “called” to me! But I can eat the food, lol!! Thanks, Chef! Oh, good – it really hit the spot! I could just drink that broth from a cup and forget everything else, lol! I did have fun with the photos – I remember when I used to be embarrassed by that old black sheet pan – it was something I just put under things I thought would drip in the oven…now it is so fun to take pictures on!